First things first. 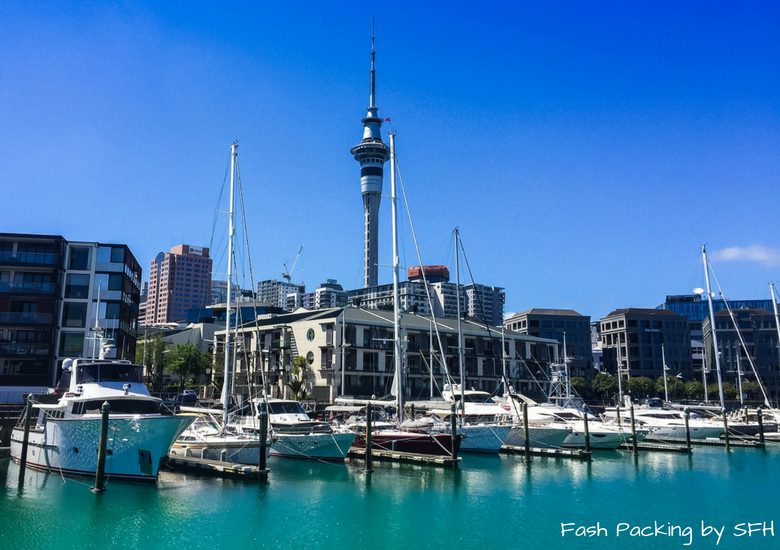 Before you even start to plan your New Zealand road trip you should check out my New Zealand essentials guide well in advance and unless you are planning to swim you are going to need to score yourself a cheap flight. New Zealand is perfect for road tripping as it’s relatively compact, the roads are good and the scenery is spectacular. 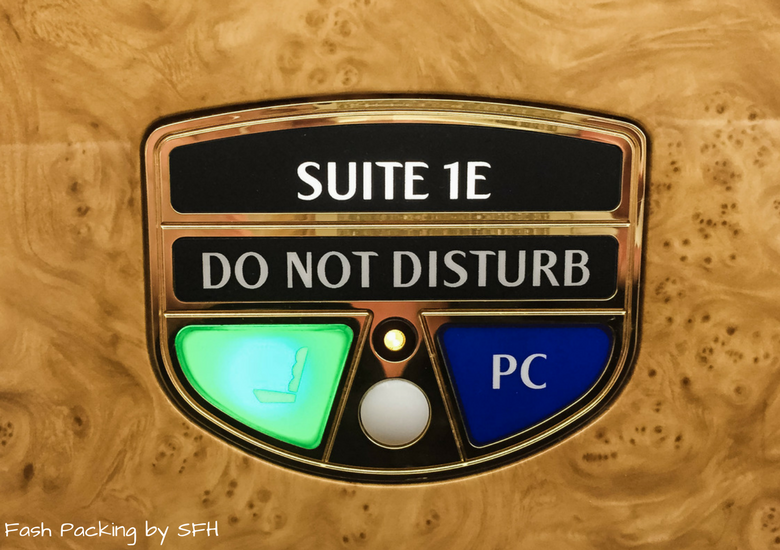 With so many great destinations, the temptation is strong to squeeze in too much but I would recommend taking a leaf out of The Hubs’ book and showing restraint. 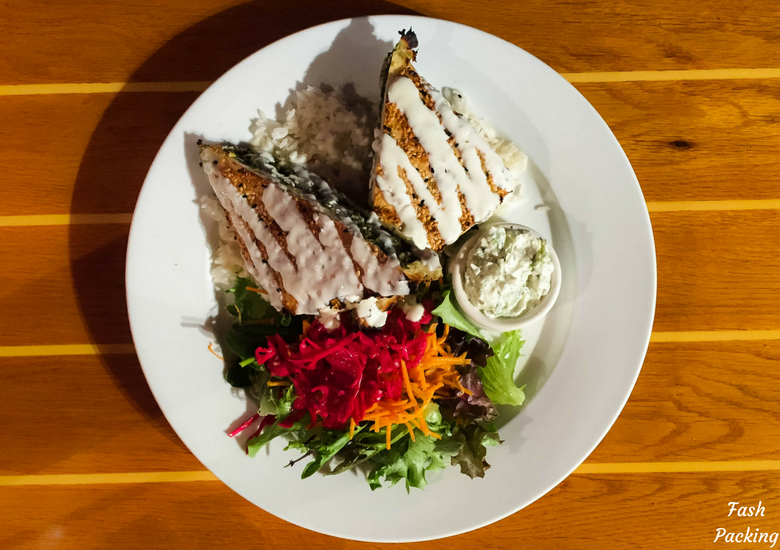 Make sure you build in some down time to linger a little longer over dinner, get lost in a good book while basking on the perfect white sands or make an impromptu stop at something that takes your fancy along the way. Planning is great but sometimes the moments that are most remarkable happen completely off the cuff. 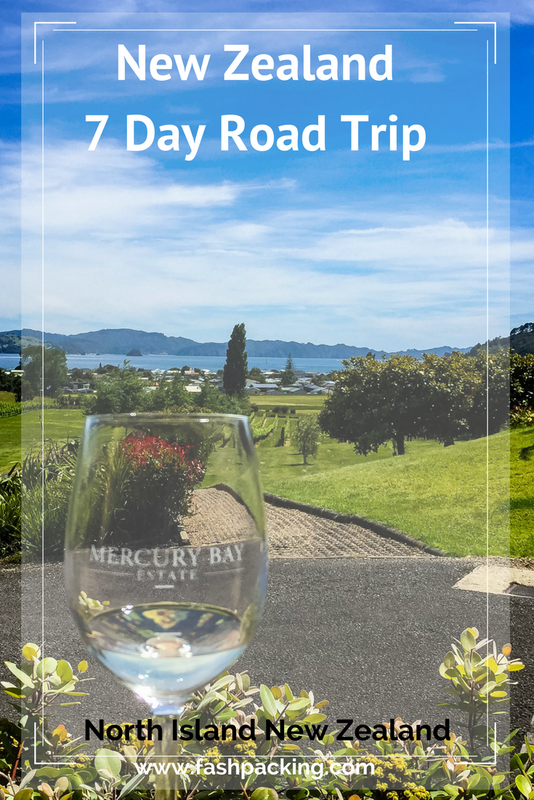 This itinerary is an overview of our week in New Zealand’s North Island, for more details on anything featured simply click the hyperlinks to the specific blog post or check out all my New Zealand posts here. Let’s hit the road! We were up at 6am Sydney time and randomly chucked a few things in our cases before heading out the door. Any other last-minute packers out there? 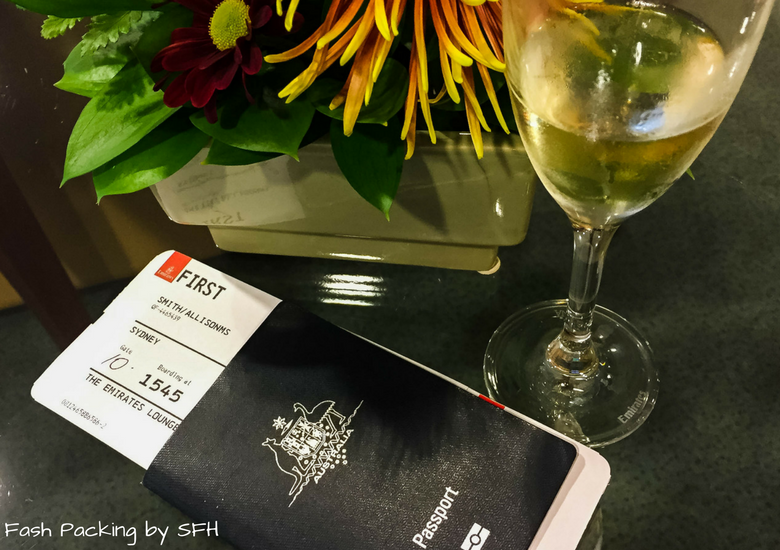 We arrived at Sydney airport at around 8.30am and headed straight to the Sydney’s Emirates lounge for some breakfast. 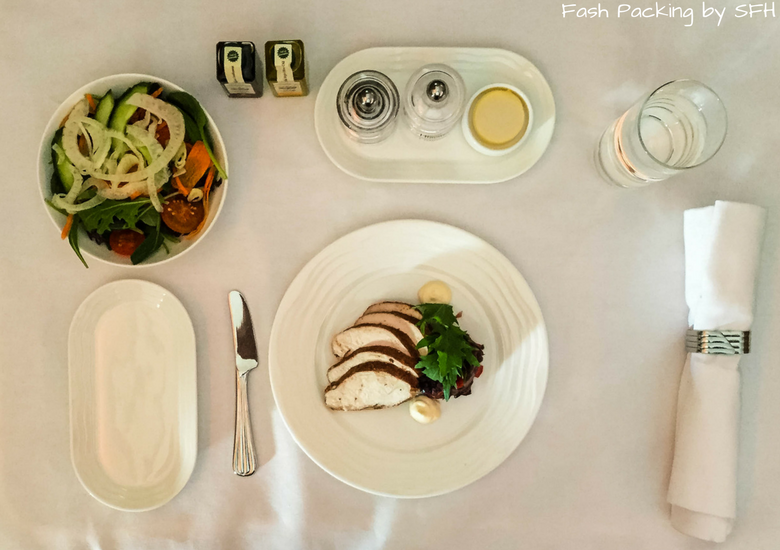 Our morning flight on Emirates A380 business class included a fabulous three course lunch and landed bang on time in Auckland at 4pm local time after the 2 hour time change. Let the New Zealand road trip begin! We didn’t have to wait long for the shuttle to collect our bargain hire car from Airport Rentals. 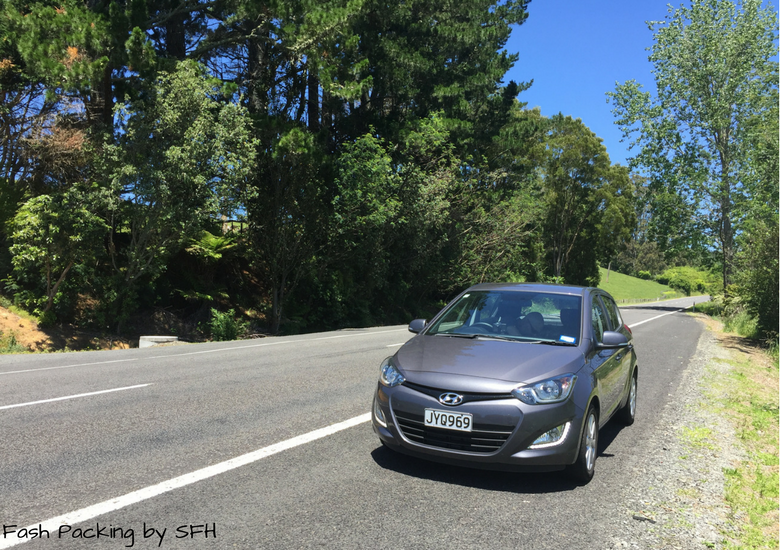 We chose a Hyundai i20 for our New Zealand road trip which was perfect for just the two of us and kind on the hip pocket. 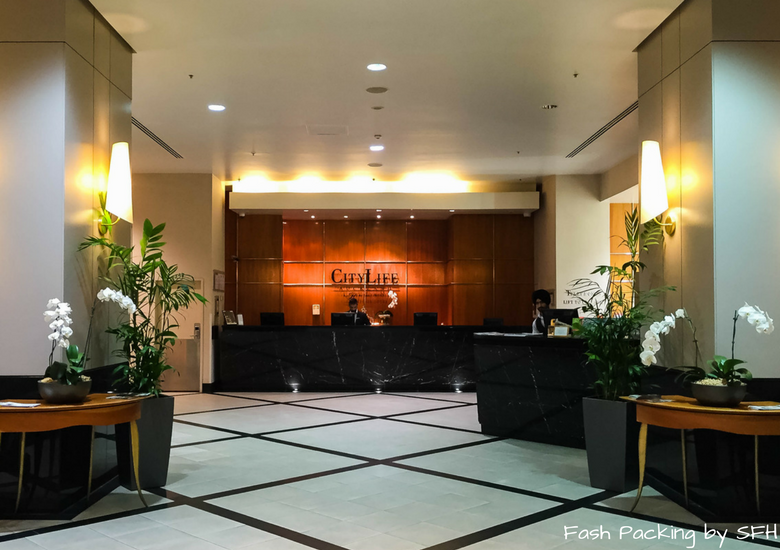 With the prerequisite checks done, we drove the short distance to Auckland CBD and arrived at our hotel, Citylife Auckland at about 6pm. 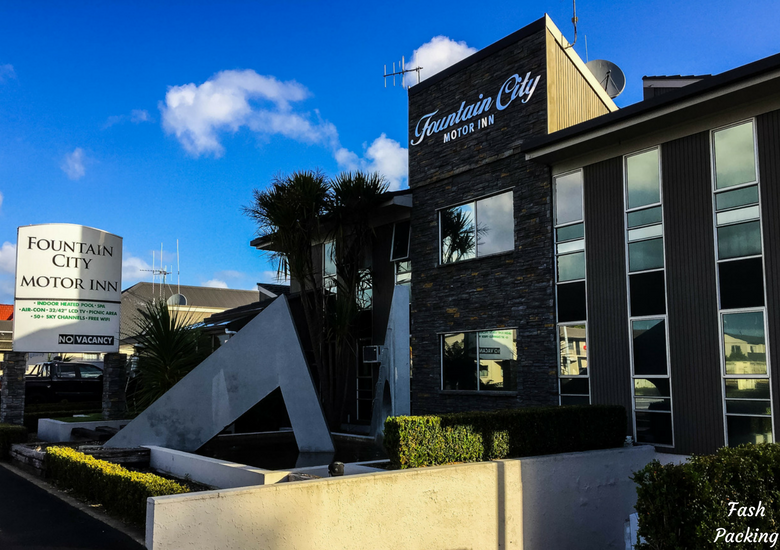 The staff at Citylife Auckland are rock stars and I cannot say enough about how fabulous our stay was. Despite the short flight, it was 13 hours door to door and as is always the case when I hit town, I was itching to explore. The run sheet dictated (no seriously that’s how OCD I am at times!) 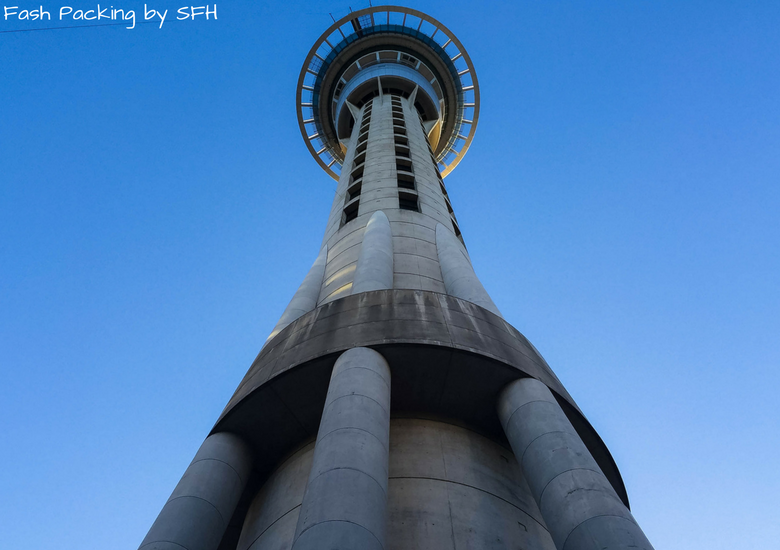 that we head to Auckland’s Skytower. The plan was to admire the view from the top but I balked at $30pp for an elevator ride so we settled on looking up instead. 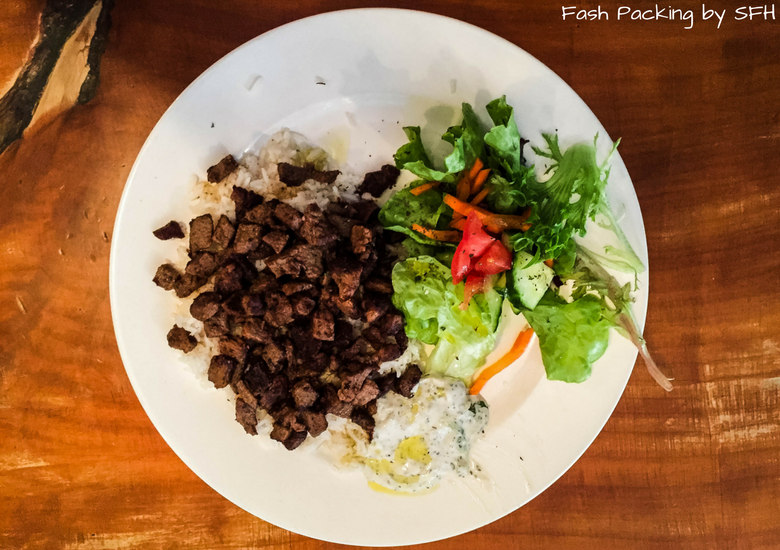 We stumbled upon Cafe Midnight Express Auckland right across the street and had a fabulous Turkish feast for dinner before exploring the surrounding area and turning in early after a long day. We woke early as we were still on Sydney time. Anyone who doesn’t believe jet lag is a thing on short flights is delusional. Most times I struggle more adjusting to a 2 – 3 hour time change than a 16 hour one. 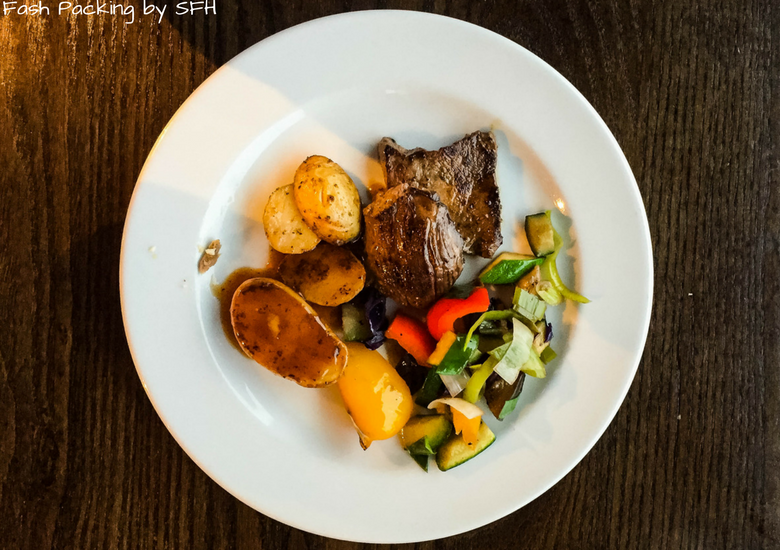 We started the day with a hearty breakfast at Citylife Auckland’s in-house restaurant Zest. I don’t often eat breakfast (I know I know!) so this was a real treat. 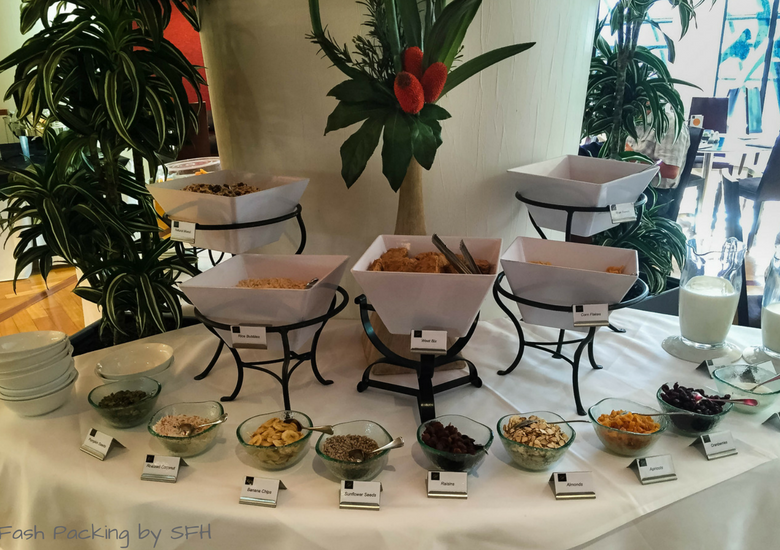 I went back to the buffet three times! I convinced myself I needed the fuel for the grueling New Zealand road trip ahead. That’s my story and I’m sticking to it! 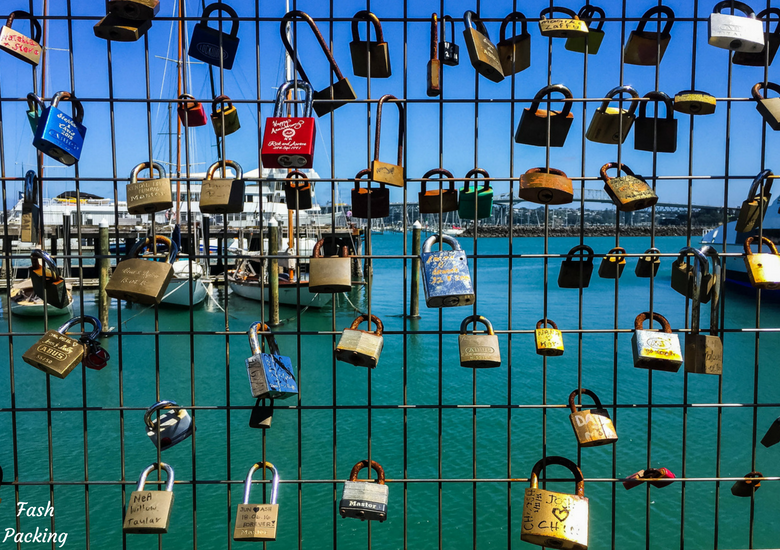 We spent the better part of the morning burning off breakfast exploring the CBD and Auckland’s Viaduct harbour. The weather gods were smiling down on us as we took in the sights of this compact town. We would have liked a little more time in New Zealand’s most populous city, but the open road was calling. Getting out of Auckland by road is a cinch, well compared to Sydney anyway, which is nothing short of a nightmare. Paddocks filled with cattle grazing peacefully surrounded us literally minutes outside the CBD. We saw cows EVERYWHERE in New Zealand, but surprisingly very few sheep. As we neared our destination the roads narrowed and snaked tightly around the mountains which made any hope of actually sticking to the speed limit impossible. Kiwis love a one way bridge and they sneak up on you before you know it so take care. On the first one we encountered we were in the middle of it before we noticed. Luck was on our side and nothing was coming the other way, but it could have been nasty. 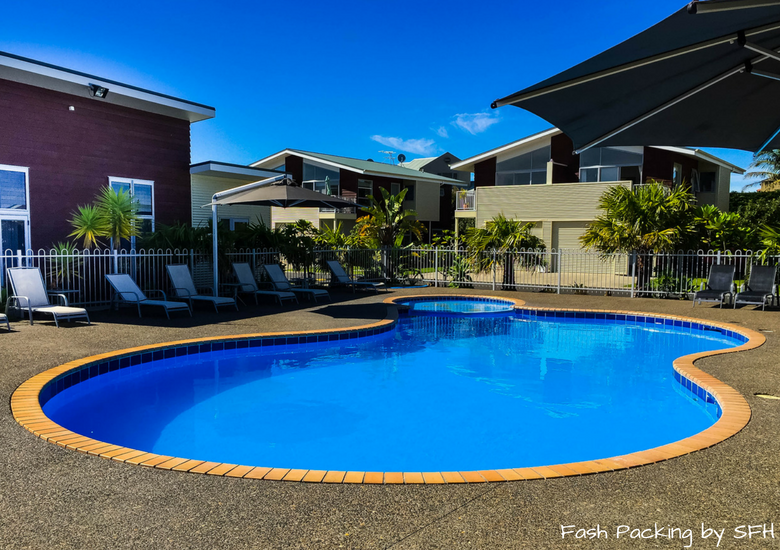 We arrived at the Beachside Resort Whitianga right on time for our 2pm check-in and the self-contained apartment which would be our home away from home for the next two days was perfect. 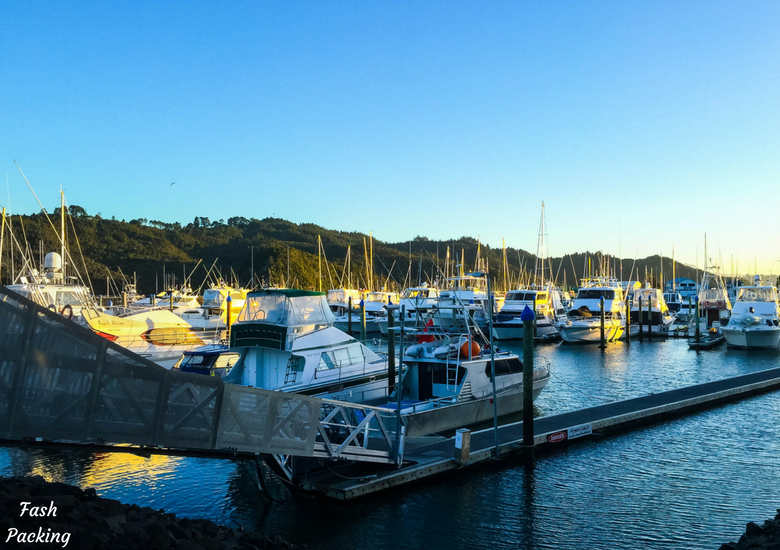 We wasted no time ditching the car and exploring the quaint seaside town of Whitianga on foot. Walking along the deserted white sands we felt like the only people on Earth. With rumbling bellies in no mood to wait we grabbed a quick bite at the first place we passed, The Whitianga Hotel. The burgers were substantial and the beer was cold so we were very happy campers when we left the building. With our hunger satisfied, we spent what little was left of the afternoon exploring the town itself. The Hubs bought a pair of Jandals as he forgot his thongs in our 6am packing frenzy. 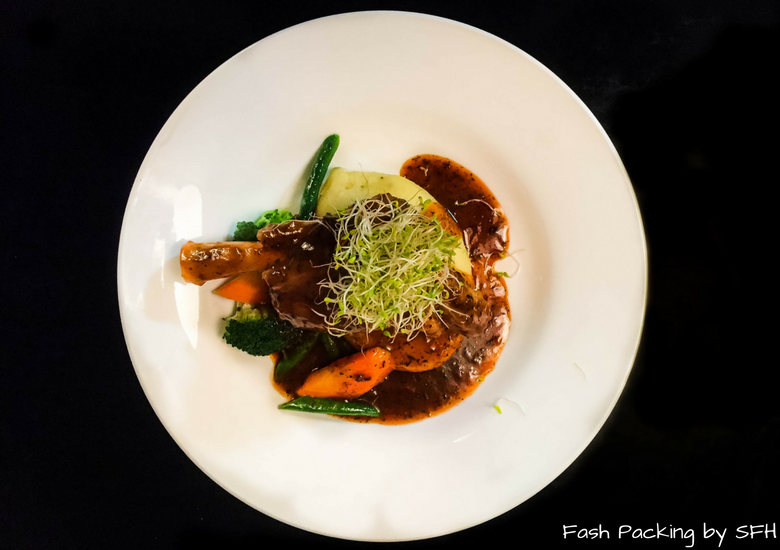 For dinner we headed to No.8 Bar & Restaurant Whitianaga to take advantage of the Tuesday night specials. The views across the marina were magical as the sun dipped below the horizon. We had a relaxing morning on day 3 (remember The Hubs’ mandated need for down time?) before heading off at 11am for the short trip to Hahei. We had intended to have lunch at The Pour House but it was closed so we gabbed a quick pizza instead. 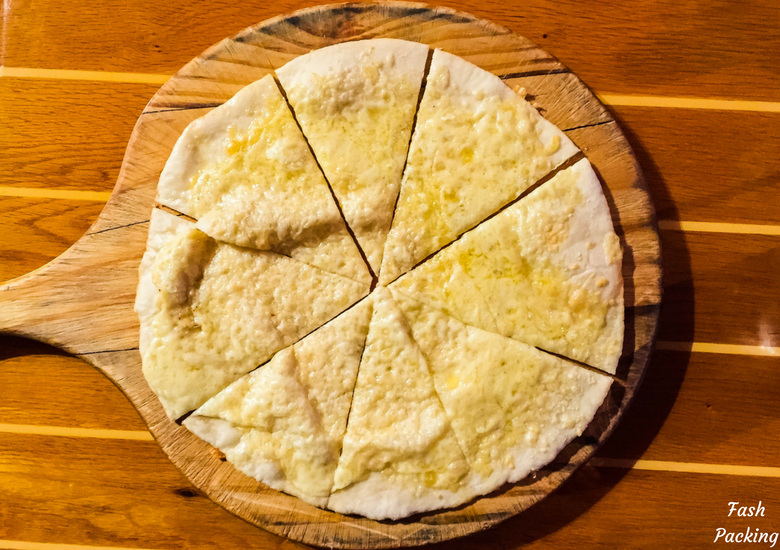 Hahei is TINY (3 restaurants on Trip Advisor) so you are not exactly spoiled for choice! 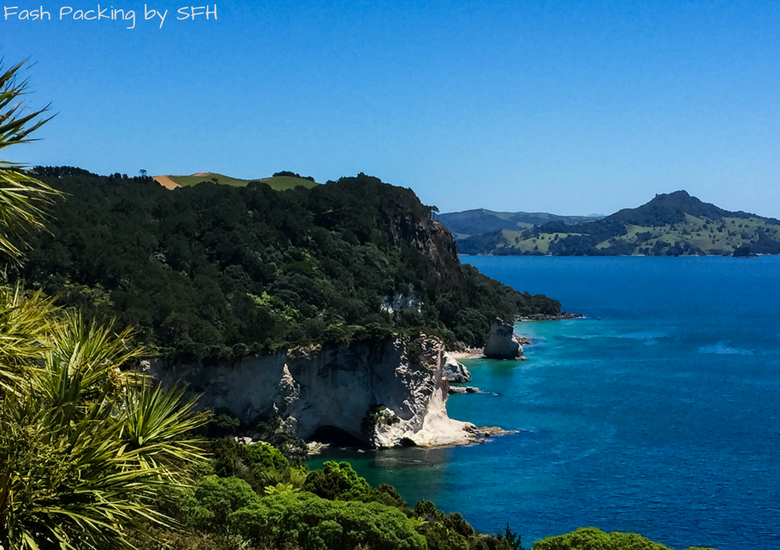 After eating our fill we headed up the hill to check out the sweeping views across Cathedral Cove and beyond. The parking is crazy so be prepared to circle a few times! One of The Coromandel Peninsula’s greatest assets is her pristine waterways and we spent the afternoon kayaking around with Cathedral Cove Kayak Tours. Cathedral Cove itself can only be reached by boat or foot and I really recommend going by water. The water looks divine but is freezing so I was happy to stay high and dry while The Hubs took a brief dip. 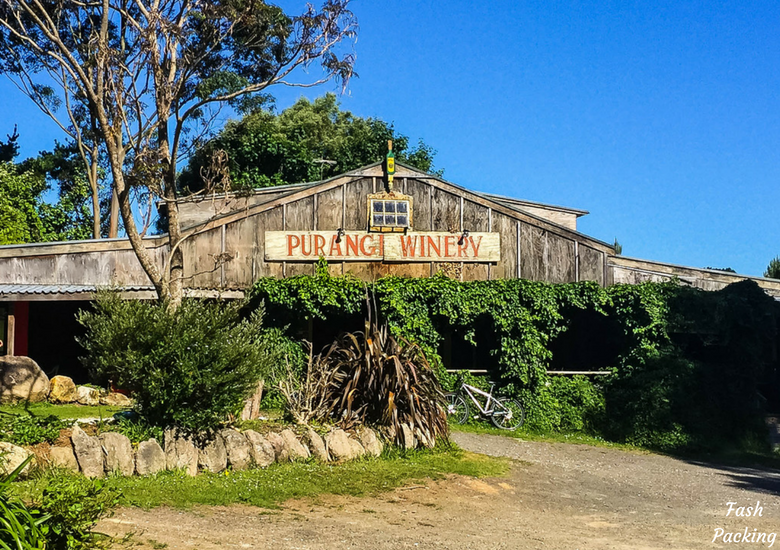 On the to way to Shakespeare’s cliff our kayak guide recommended we stop at Purangi Winery. 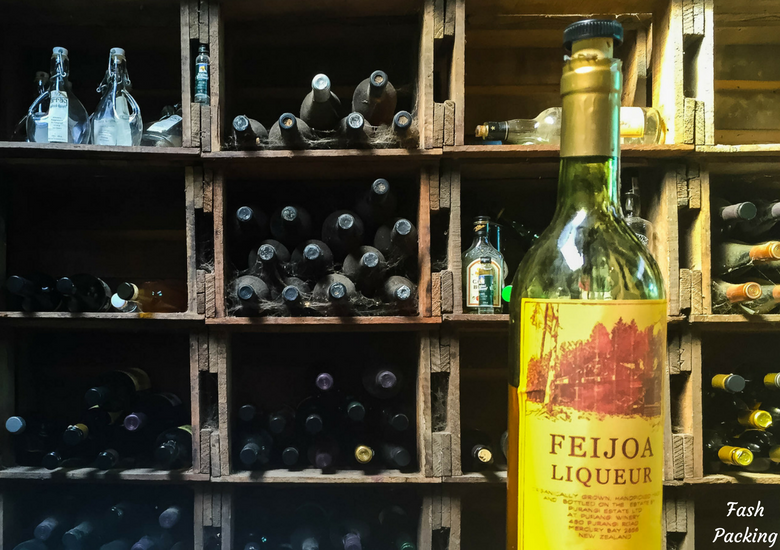 This rustic little winery is almost too cute for words and we tasted the local specialty, Feijoa Liqueur. When most people think of New Zealand fruit, the Kiwi Fruit immediately comes to mind but the humble Feijoa is severely underrated. Of course I bagged a bottle to take home. Getting to Shakespeare’s cliff involved some dirt roads and slow going but the views from the top are worth it. It is not particularly well-known so we had the area to ourselves save for one crazy local who push biked all the way to the top. We arrived back in Whitianga with just enough time to shower off the salt residue and head out to dinner at Al Camino Restaurant Whitianga. 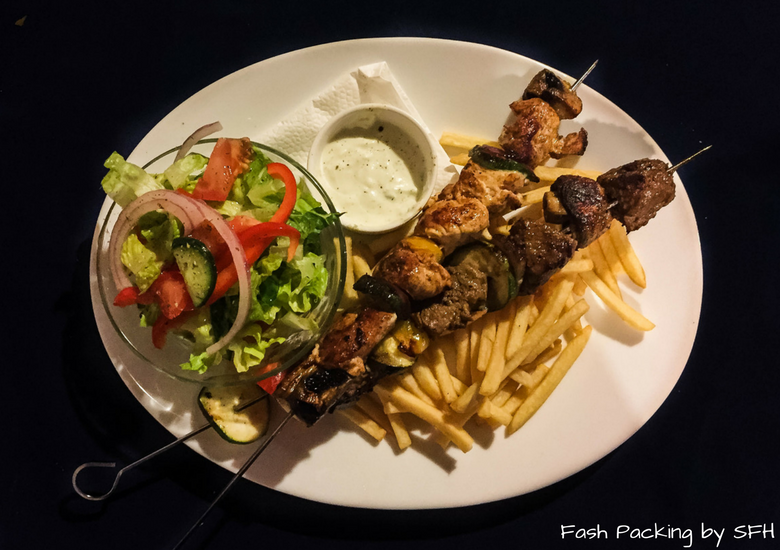 The service was a little lack lustre and the menu was not exactly traditional Greek but we had an enjoyable night before hitting the pub for a few coldies. We had to fuel the mighty Hyundai i20 for the first time before starting out on day 4. 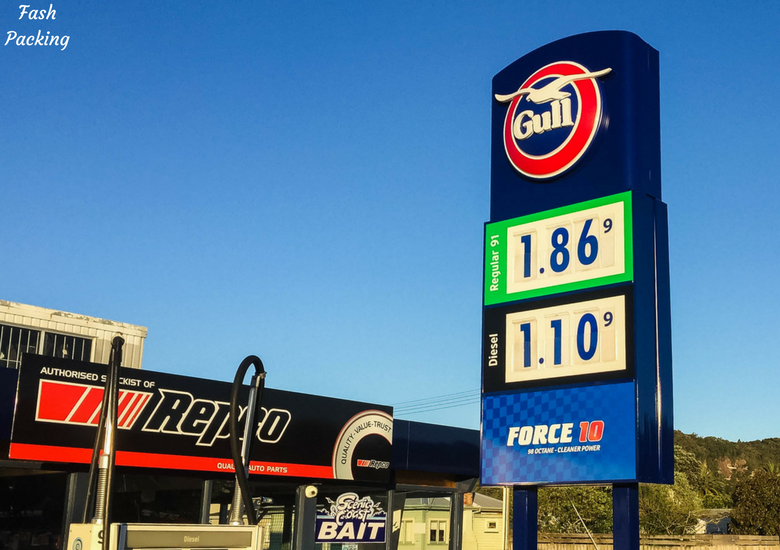 Petrol in New Zealand is expensive and a key consideration when planning a New Zealand road trip. This cheapest we found was around $1.60 and the most expensive we paid was $1.99 a litre. I’m very glad we booked a compact car! Hot Water Beach was our first stop of the day. This place is crazy busy. Hordes of people flock to a small corner of this pretty beach 2 hours either side of high tide to dig their own spa. 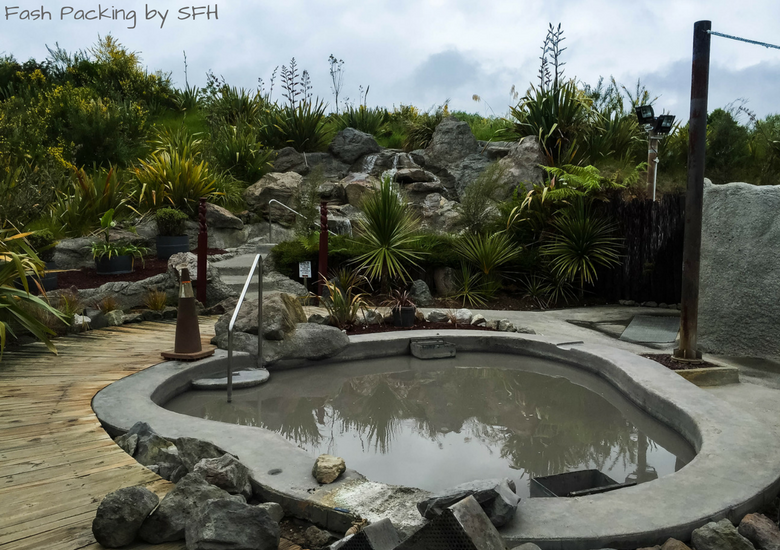 The water is naturally heated by geothermal activity and can reach temperatures of up to 60°c so use caution. Parking is on the meter, but will only set you back a couple of bucks an hour if you are lucky enough to score a spot in the main car park. 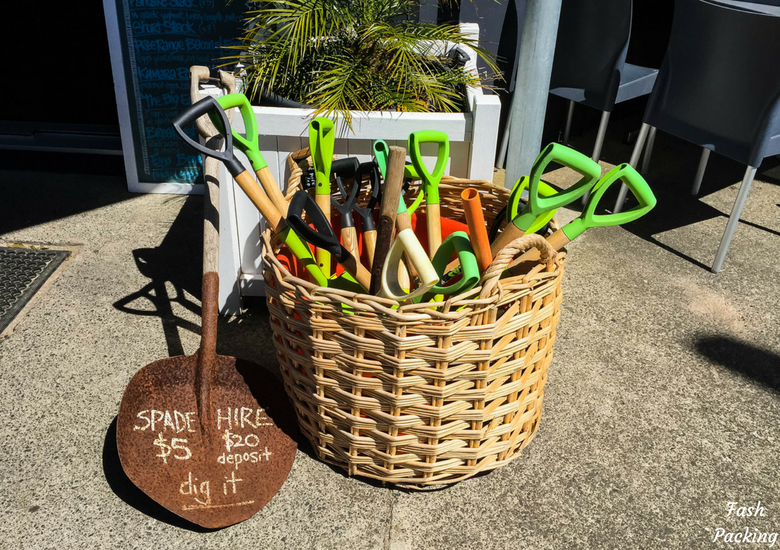 If you don’t have a shovel, you can hire one from the kiosk near the car park. 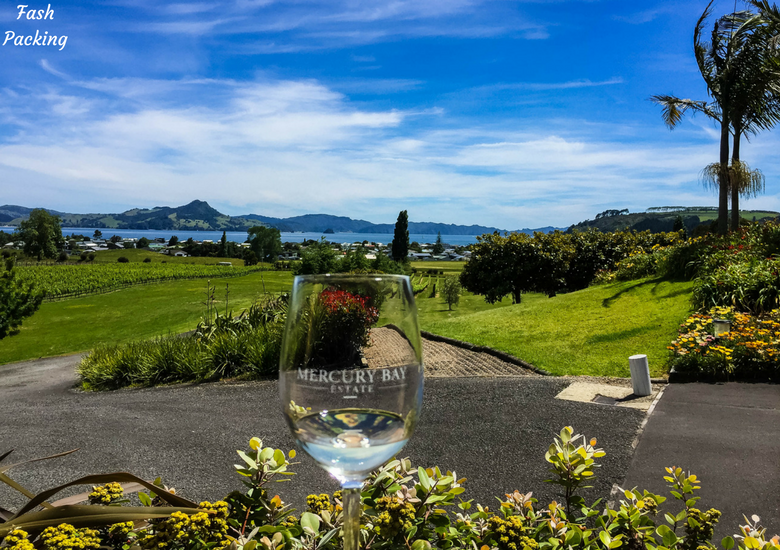 We made a pit stop at Mercury Bay Estate on Cooks Beach to sample the local drop before bidding farewell to The Coromandel Peninsula. 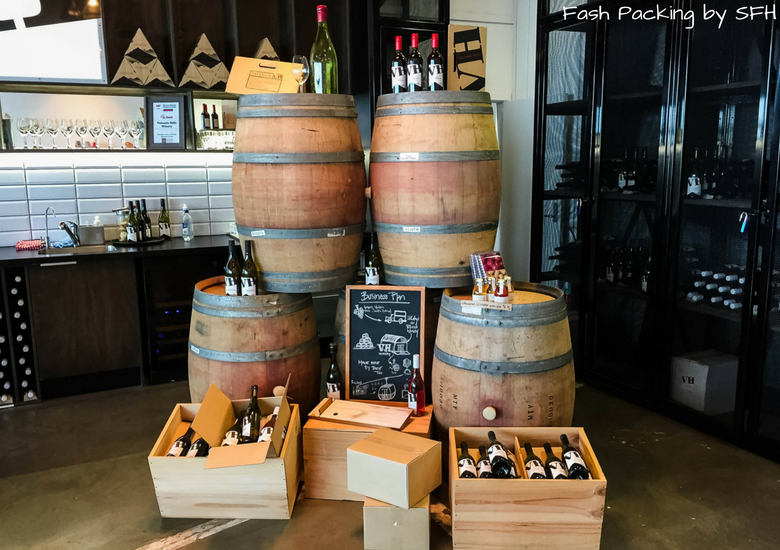 Tastings are not free, but the pours are generous and you can taste 4 for $18. 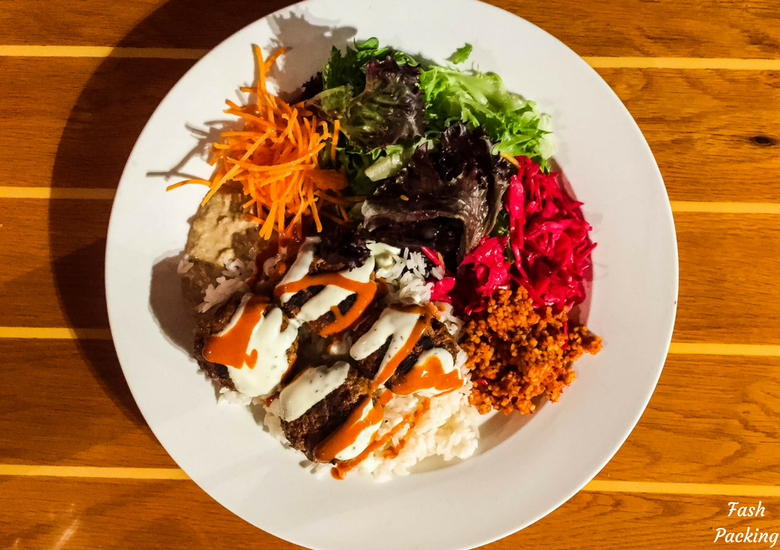 If you are feeling peckish grab a bite from the kitchen before moving on. The drive from The Coromandel to Rotorua was uneventful, but as we have come to expect the roads were windy, one lane and not conducive to planting your foot. We rolled into The Regent of Rotorua at about 3pm. We were hot, sweaty and hangry but my mood lifted as soon as I stepped through reception of this delightful little boutique hotel. I happily took all the credit for picking so well. 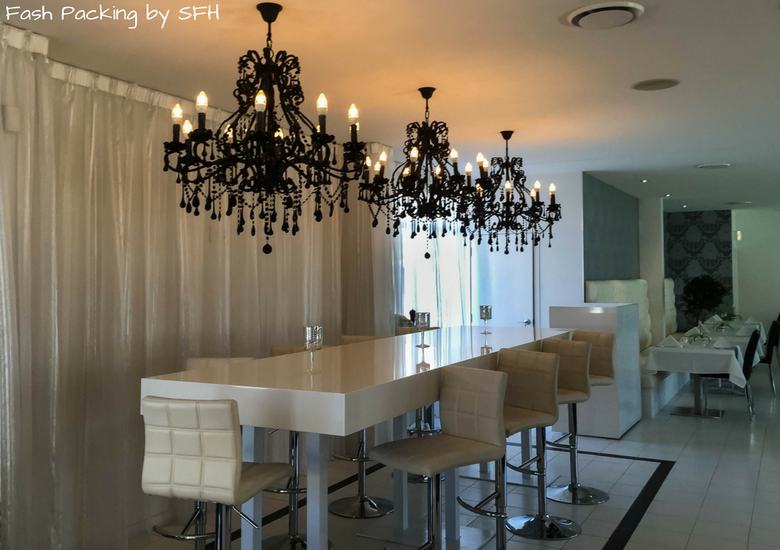 If you like the look of reception, just wait until you see the rooms! We had no time to lose and after grabbing a quick drink from the hotel mini bar we were on the road again to Te Puia for a 4.30pm start. 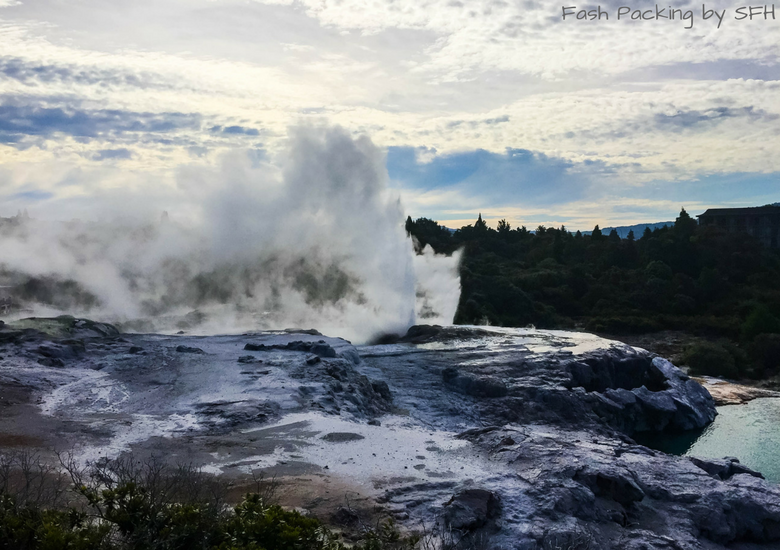 Rotorua is famed for its geothermal activity and Te Puia is one of the best places in the area to see gushing geysers and experience authentic Māori culture. On our visit to Te Puia we covered both the Te Rā and Te Pō experiences and I suggest you do the same. 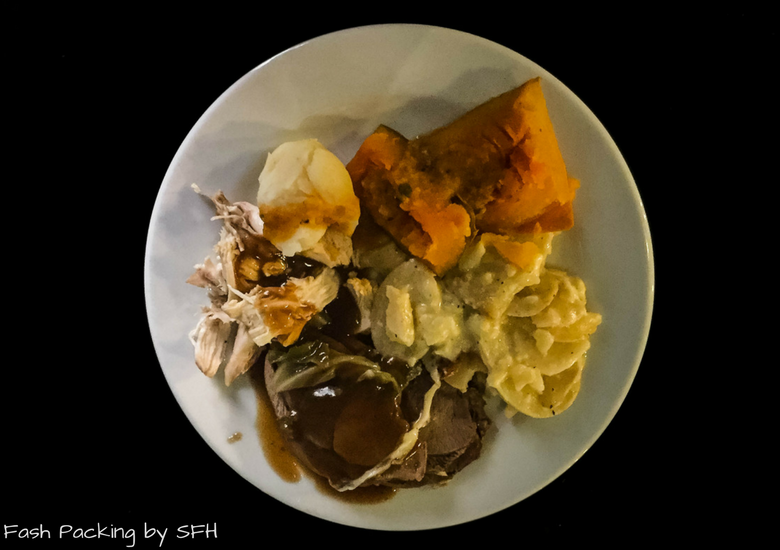 Te Pō includes a fabulous hāngi feast and after not having any breakfast or lunch we went to town on the buffet. 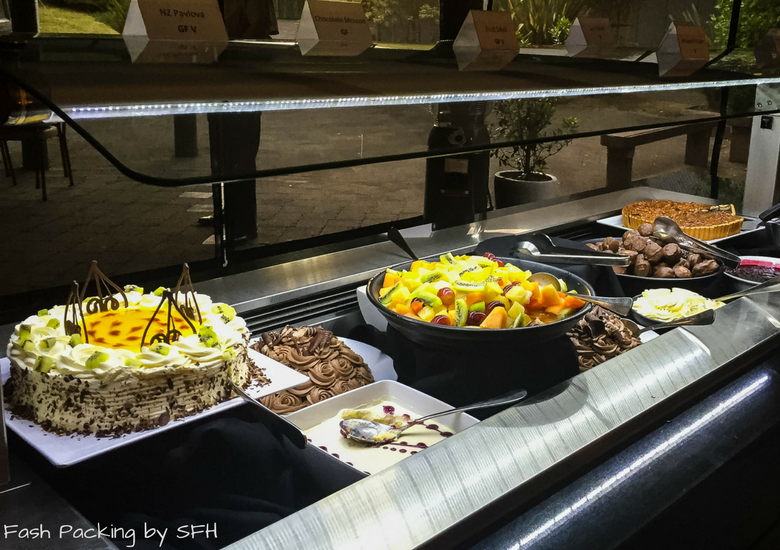 Just look at those desserts! On the way home from Te Puia we stopped in at Countdown Fairy Springs for supplies. Call me weird, but I have a strange fascination for supermarkets abroad. It’s a mundane task I begrudge at home, but transport me overseas and I’m like a kid in a candy shop. I love seeing how much others pay for the basics and delight in snooping the unfamiliar brands. The bottle-o at Countdown at Fairy Springs was huge. 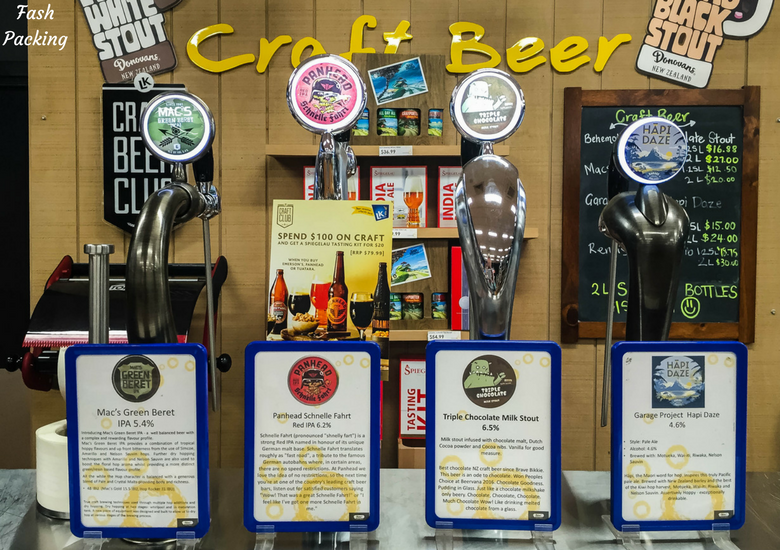 We spent ages picking a couple of bottles of wine and a six-pack from the huge range and I thought the craft beer station was genius. Those so inclined can fill a 2 litre bottle from an ever-changing tap menu and take home the spoils. I have never seen anything like it in a supermarket anywhere on the planet. 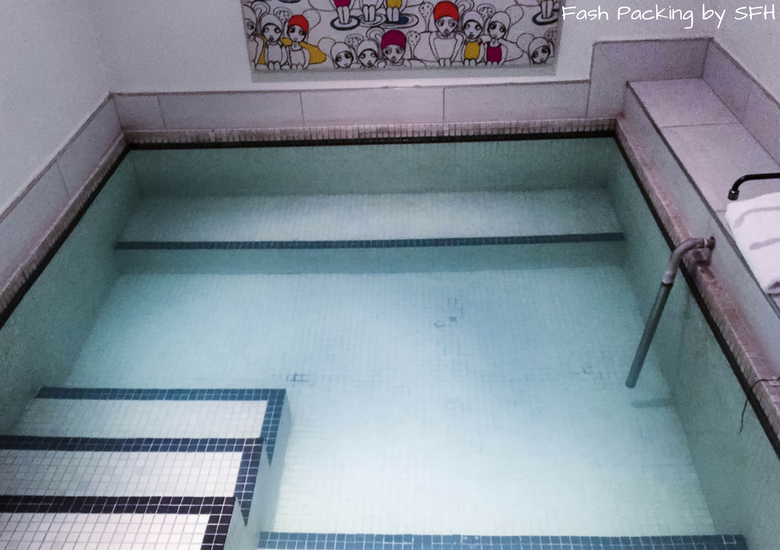 We couldn’t resist a soak in The Regent of Rotorua’s in-house mineral pool before bed. 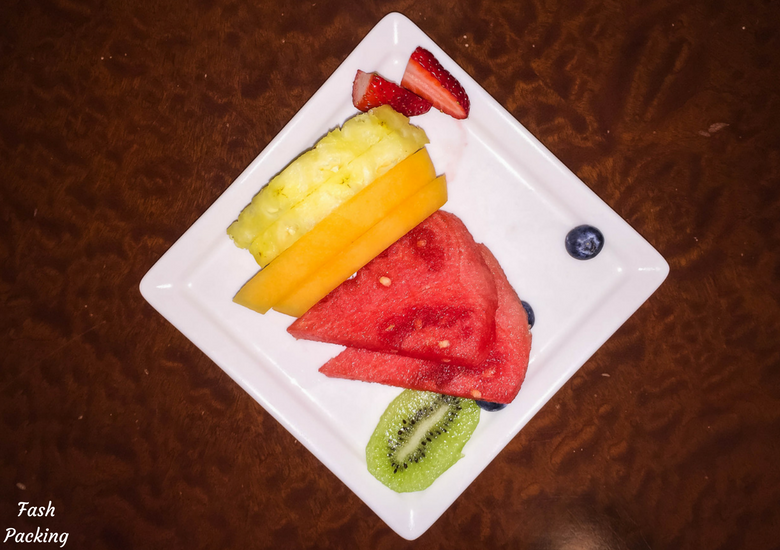 It was the perfect way to end the night and my skin felt sensational afterwards. They say there is no rest for the wicked and we were up early on a dismal day to head to Hells Gate Rotorua for our morning activity. The geothermal park is fascinating and I really suggest taking the free guided tour to get the most out of it. I was particularly blown away by the tranquil forest in the heart of the hissing, gurgling and exploding terrain. Afterwards we headed to Hells Gate’s day spa with a difference, where we enjoyed a relaxing soak in the mud and sulphur pools. We grabbed a light (very late) lunch at Cafe Ephesus in Rotorua’s Eat Street (#123 of 174 on Trip Advisor) before heading back to the hotel for a spell. 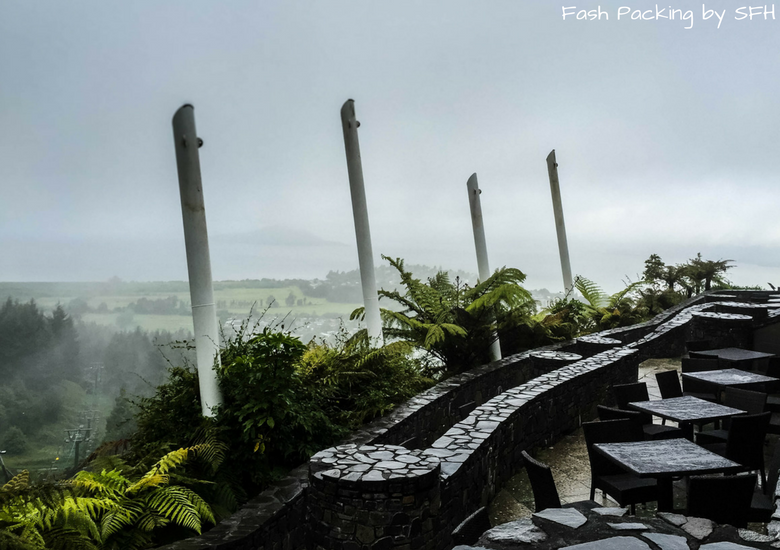 The weather had not eased one bit and we lamented our bad luck as we drove the short distance to Skyline Rotorua where we started the night with a wine tasting at Volcanic Hills winery. It was supposed to be wine tasting with a view but the mist shrouding the area meant we could scarcely see two feet in front of us. 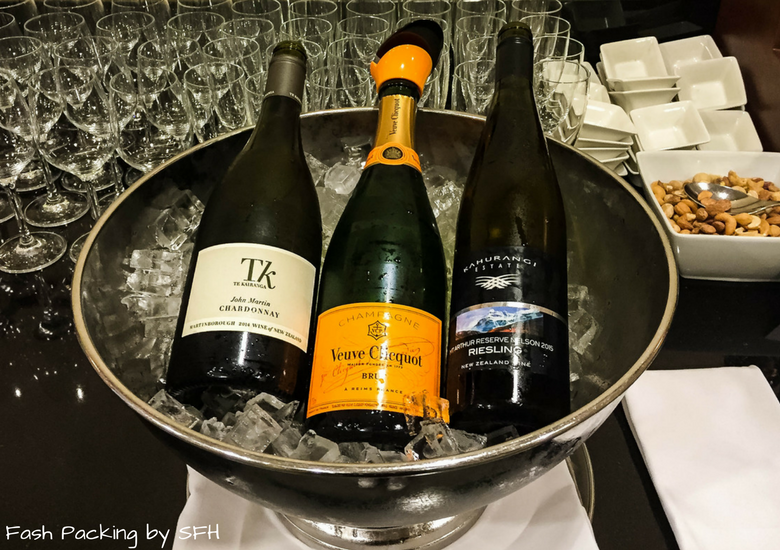 I added another bottle to my wine haul before we made our way downstairs to Stratosfare Restaurant for the most amazing buffet I have ever seen. 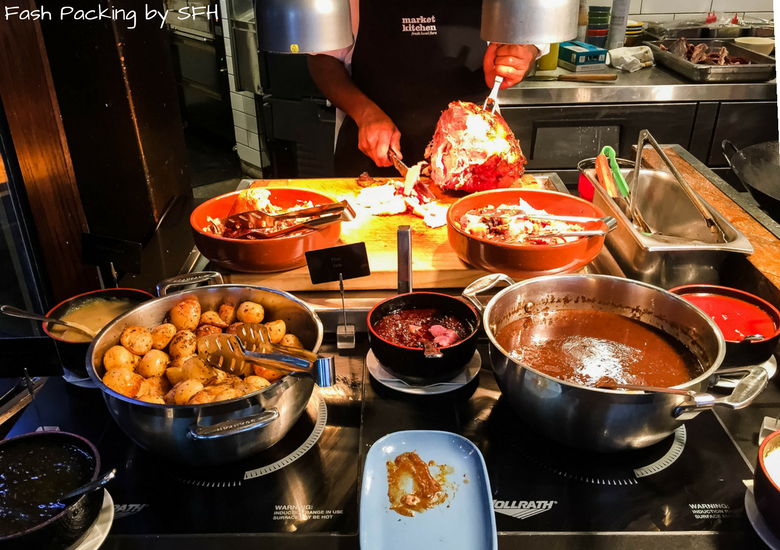 We enjoyed a particularly leisurely meal but we unable to sample everything on offer from the incredible spread. We had planned to do star-gazing after our meal, but sadly the weather scuppered those plans and we boarded the gondola back down the hill earlier than expected. Luckily The Hubs took it easy on the beers as he got breath tested on the way home. The weather had miraculously cleared overnight as we bid Rotorua farewell to begin the next leg of our New Zealand road trip. Small towns flashed past the window in a blur on the way to Waitomo. After the briefest of lunch stops at Maccas in Otorohanga we continued on to Waitomo Caves for an afternoon underground. 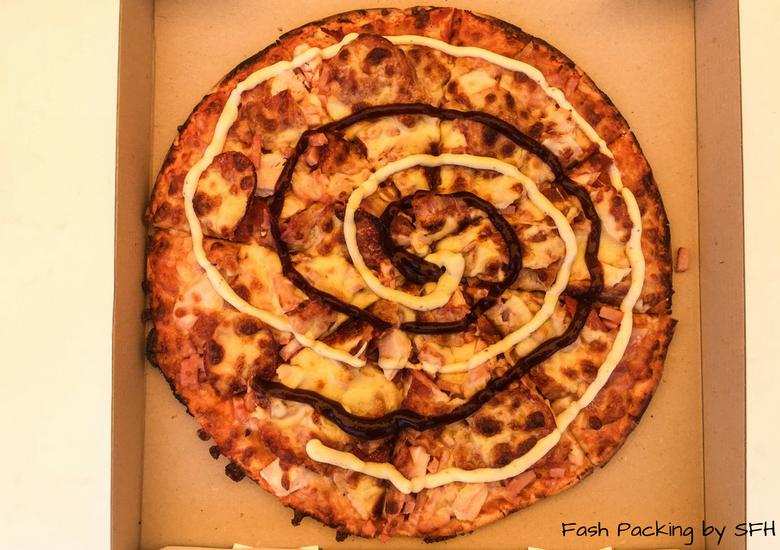 There are three caves to choose from and we chose the glowworm and Ruakuri combo. After our caving adventure, we pointed the Hyundai towards Hamilton, New Zealand’s fourth largest city. We arrived in Hamilton at around 5pm and the city was larger than I expected. We weaved our way through peak hour traffic to the Fountain City Motor Inn. Unbeknown to us, the cricket was in town and we were glad to have booked ahead when we spied all the ‘no vacancy’ signs. The New Zealand vs Pakistan test match was obviously much more popular than I imagined. 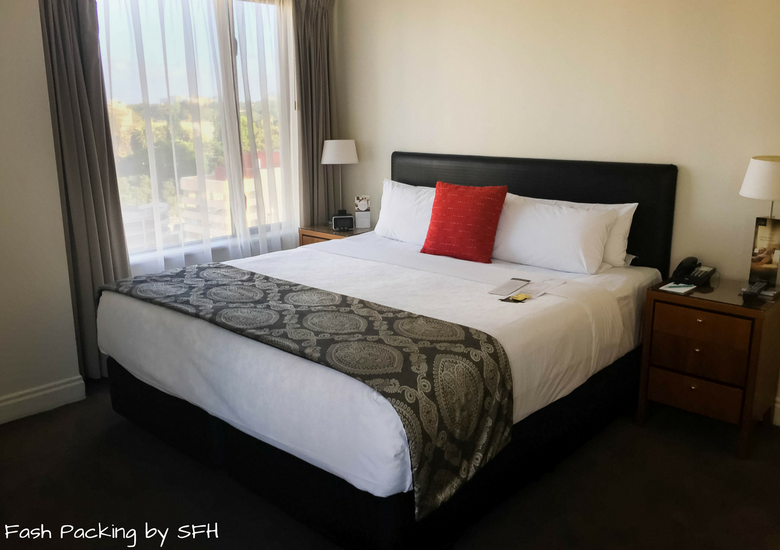 I did most of the planning for this trip (as usual) but I was very underwhelmed by our choices for accommodation in Hamilton. Nothing spoke to me from the endless list seemingly identical motor inns on offer and the few hotels were expensive, so I threw my hands in the air and left The Hubs to it. We paid $110 for the night and it was just OK. The Hubs however, had more of a vested interest and was quite happy with his choice. In fact, he proclaimed the shower the best he had experienced in NZ. He even liked the complimentary toiletries which finally got the smell of sulphur out of his skin from Hells Gate which clung a little more lovingly to him than it did to me. Our motel was on the outskirts of town (thanks babe!) so we had to drive in for dinner. The town was packed, presumably with cricket fans, and it took about 20 minutes and three trips around the block to find somewhere to park in a random side street. We wandered aimlessly along the main street for an hour reading the menus out the front. Nothing spoke to us so when we spotted The Hogs Breath Cafe on a side street we went for the easy option that we knew from home. As we were being seated our server informed us they were out of prime rib. Are you kidding me? It was only 7.30pm??? She explained that they have been “incredibly busy” (bloody cricket fans!) but it’s no excuse and we made a hasty retreat. Hungry, uninspired and out of options we sat in the car in our hard-fought-for parking spot searching restaurants in Hamilton on Trip Advisor while making the universally acknowledged hand signal for “we are not leaving” to every optimistic punter that pulled up along side with a look of hope in their eyes. 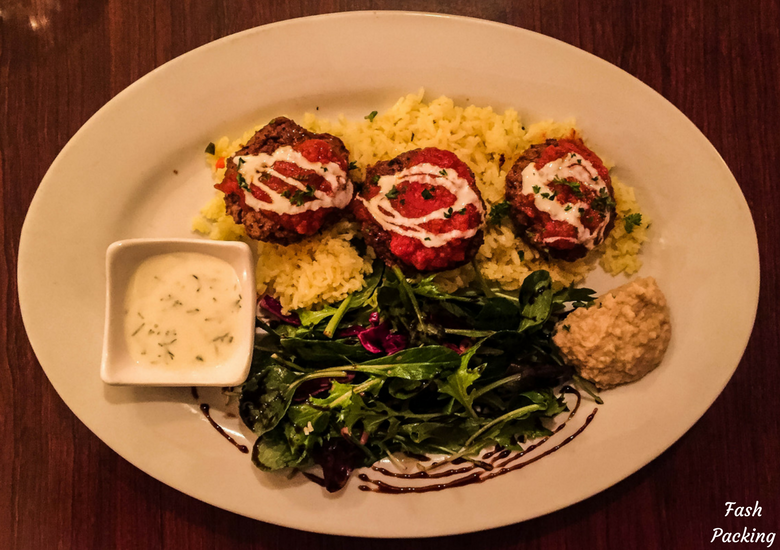 We settled on Babaganush in East Hamilton (#18 of 286) which was just a short drive away. You cannot believe how much it pained me to give up that parking space! East Hamilton was like a different world. We immediately found a spot right out the front in this much less congested area of town. Clearly the cricket fans don’t venture further than a few city blocks. We had a lovely meal and the service was speedy. 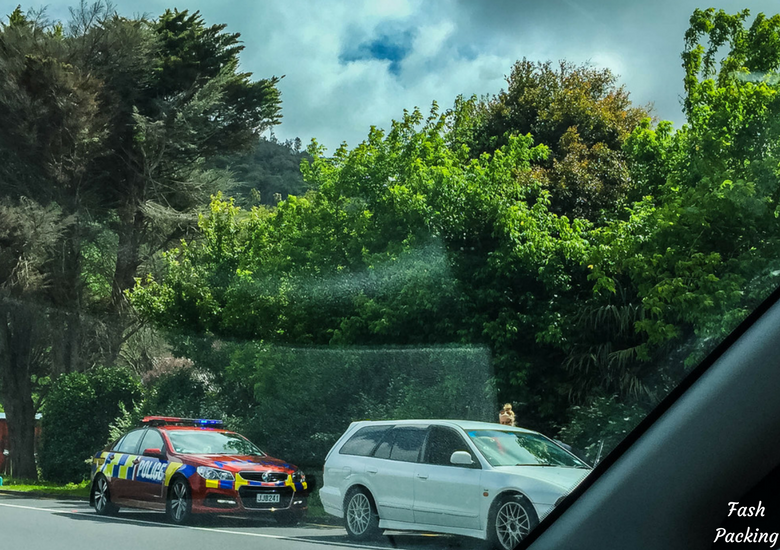 On the short drive home we encountered our second RBT of our New Zealand road trip and the local constabulary picked out our little Hyundai i20 once more. This time The Hubs did not pass the initial screening and with trepidation he pulled over for the secondary test. I have to admit I was a little worried as we were due to fly out the next day and while I knew that The Hubs should be well under after only two beers, my mind immediately started to conjure the worst possible scenarios. I’m not sure what the final reading was but he passed so we left without asking too many more questions. Despite the early hour (around 10pm) we decided not too push our luck and headed ‘home’ for a quite evening in front of the TV for our last night in NZ. On the last day of our New Zealand road trip, I decided to cut The Hubs some slack and didn’t schedule anything. Nada. Zip. Not a single damn thing! Check out was 10am and the hotel staff were literally knocking on the door at 10.01am requesting we exit the building. We can take a hint and hit the road soon after. The road out of Hamilton follows the rail line and Waikato River before hitting the highway 1 to Auckland. Police cars abound so make sure you stick to the speed limit. 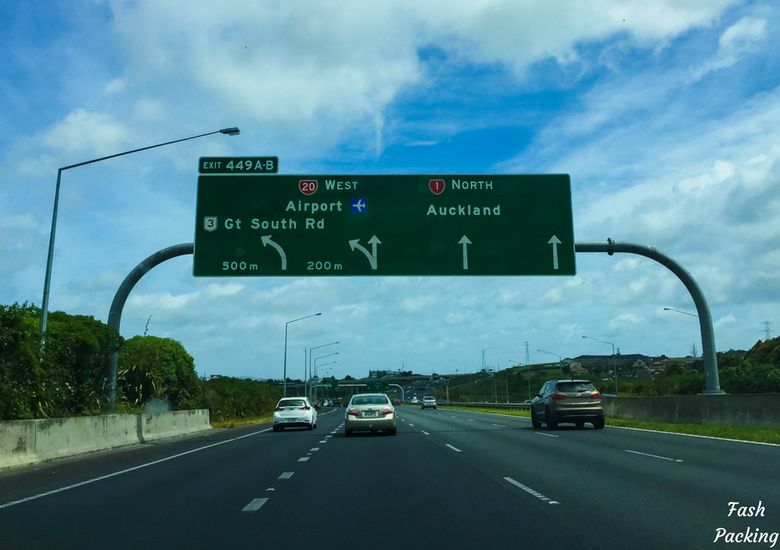 There is sooooooooo much road work around Auckland airport and the GPS had trouble picking up exactly where the roads were due to all the changes. We had a terrifying moment when The Hubs took a turn as directed by the GPS that landed us on the wrong side of the road in the face of oncoming traffic. It was pretty clear from the blasting of horns that the locals were less than impressed with our antics. As any good road tripper knows you have to return your loaner car with a full tank of juice. The unmanned petrol station we chose was literally a 1 min drive from our drop off in Mangere. 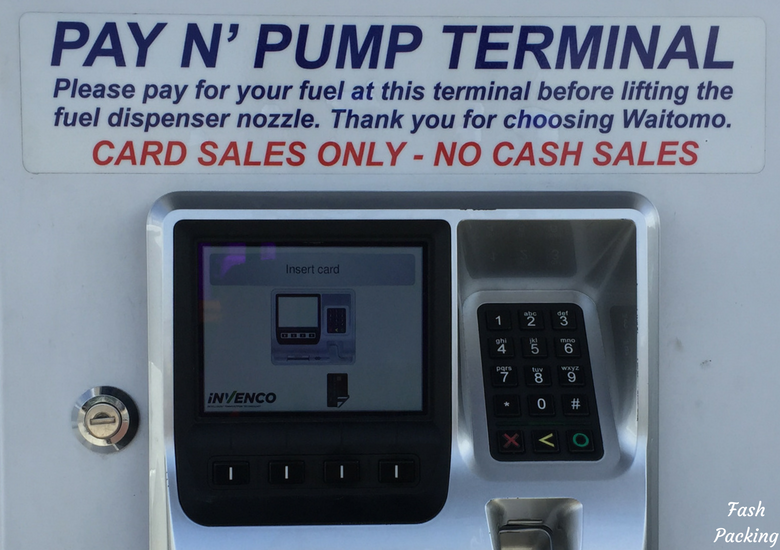 Picture this … you have 10 patrons, all with hire cars, some with less than perfect English, all vying for the four automated pumps and all with no clue what they are doing. To make matters worse, when we checked internet banking we noticed NZD$150 missing from our account and not the NZD$46 we expected. We rang the number provided and were told this is standard amount taken as an ‘authorisation’ and adjusted to the real amount a few days later. My advice? Just go to a normal petrol station. The car drop off was simple and after a quick look over the car the attendant drove us the 5 minutes to international departures. We were so early that check in had not opened which is never us. We are usually the ones being paged with threats of having our bags offloaded as we leg it to the departure gate. 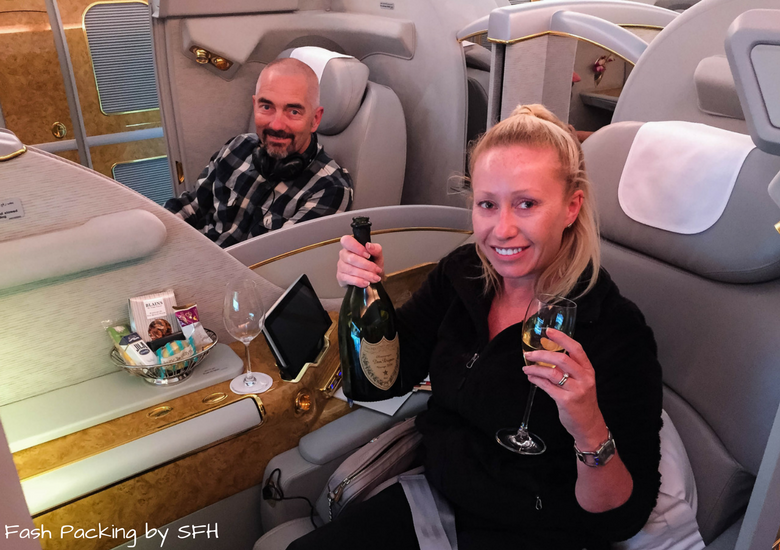 We wanted to end our New Zealand road trip in style so we decided to fly home first class on Emirates A380. 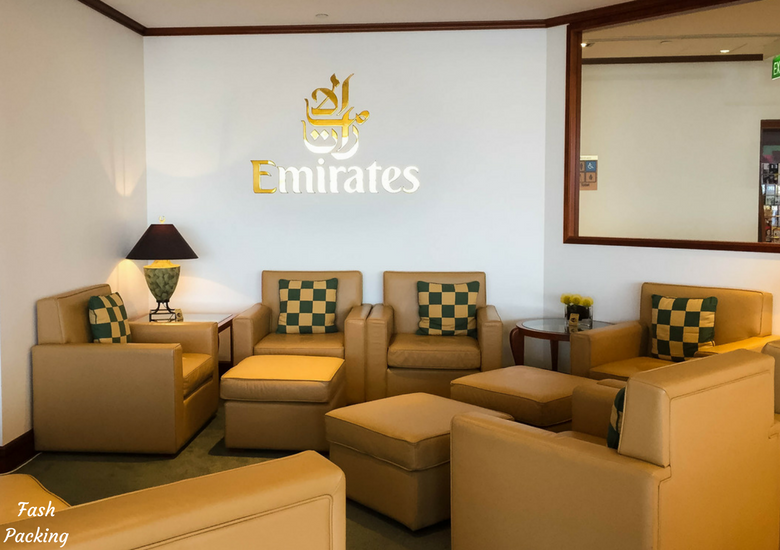 After check in we headed to straight to the Emirates lounge Auckland International to enjoy the spoils a premium boarding class brings. 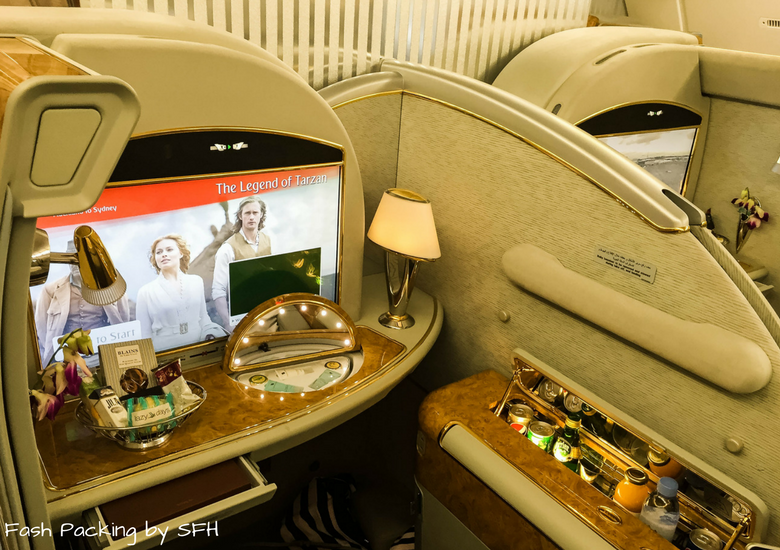 If you only get to travel first class on Emirates once in your life grab it with both hands as it’s out-of-this-world! Did I mention there is a shower on board? And Dom Perignon Vintage Champagne? 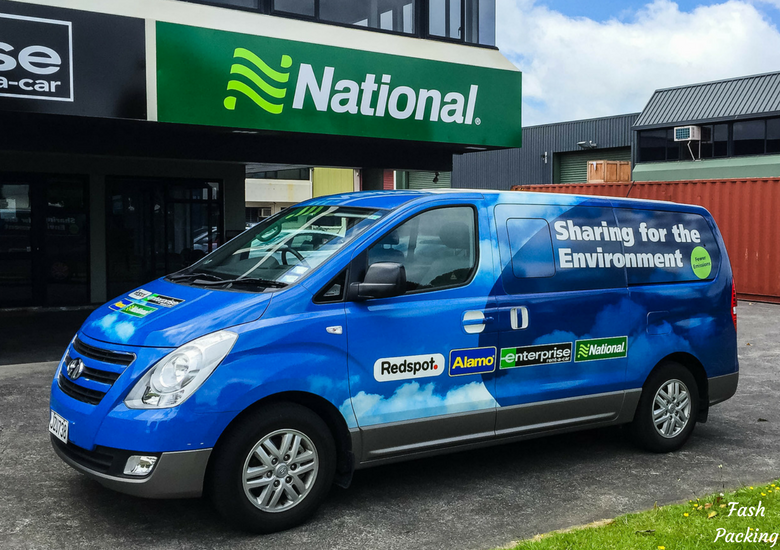 Are you planning your own New Zealand road trip? I would love to hear what’s on your itinerary in the comments below. 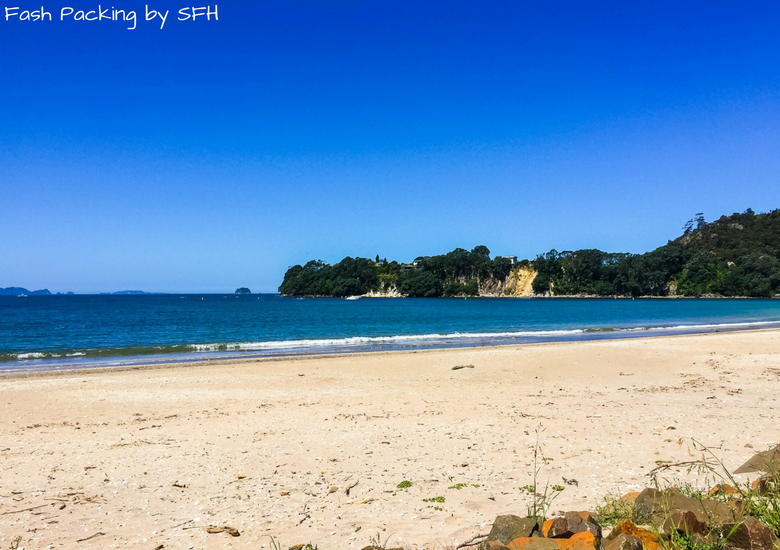 Disclaimer: I was graciously hosted by Citylife Auckland, Waitomo Caves, Cathedral Cove Kayak Tours, Te Puia, Hells Gate, and Skyline Rotorua on our New Zealand road trip and received discounted rates at Beachside Whitianga and The Regent Of Rotorua. I honestly have nothing against cricket fans and no offense is intended. This post contains a couple of affiliate links and if you make a qualifying purchase I may earn a few cents to help with the costs of keeping this blog running. As always, all opinions are my own. I went around the North Island by bus a very long time ago 🙂 I thought the Waitomo glow worms were amazing. And there are meadows a hike away across a wood near the YHA with sheep grazing, so picturesque! Sounds like it’s still like that! The caves were so cool Teja! Might be time for you to go back! I haven’t been to NZ since I was about 7, and although I remember quite a lot of the main attractions, I’ve been planning to go back and see it as an adult. 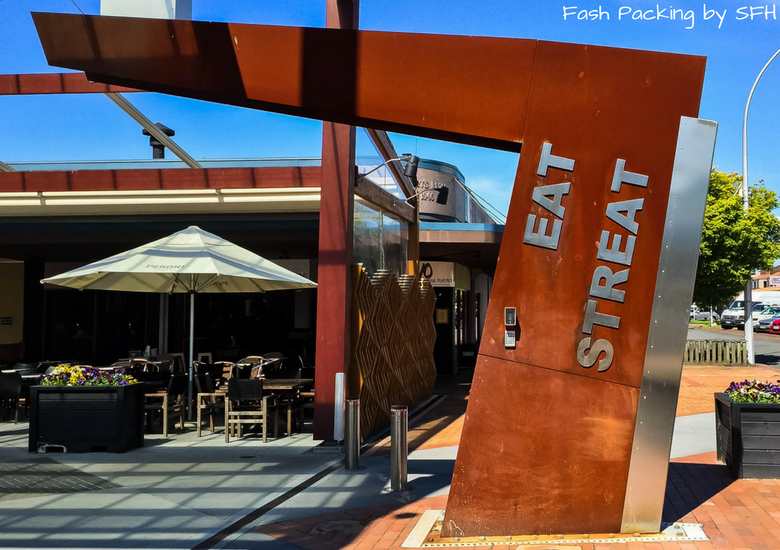 This itinerary looks great – enough variety, not too much driving each day and awesome places to eat! And luckily, I’m used to fuel prices like that from travelling in the Aussie Outback! Sounds like it’s time to go back Marion! The fuel price was a bit of a shock but we took it in our stride! Luckily we had a little car ? What an excellent itinerary for New Zealand, Allison! I am saving your post for my nxt trip there! I’ve only heard great things about New Zealand. We were lucky enough to see a glimpse of its beauty, but I want to explore some more. You’ve shown me a few things that I would and could try! Hope to tick some of them off my bucket list! New Zealand is truly spectacular. A week was not enough and I hope to go back and see some more one day ? Oh my god, all those foooods! I want to try them all 😛 New Zealand looks like such a wonderful place, I can´t wait to visit one day! I love NZ, I lived there for a year. Your pics really make me miss the place and want to be back there. I lived opposite the sky tower and worked down on princes wharf near the viaduct. 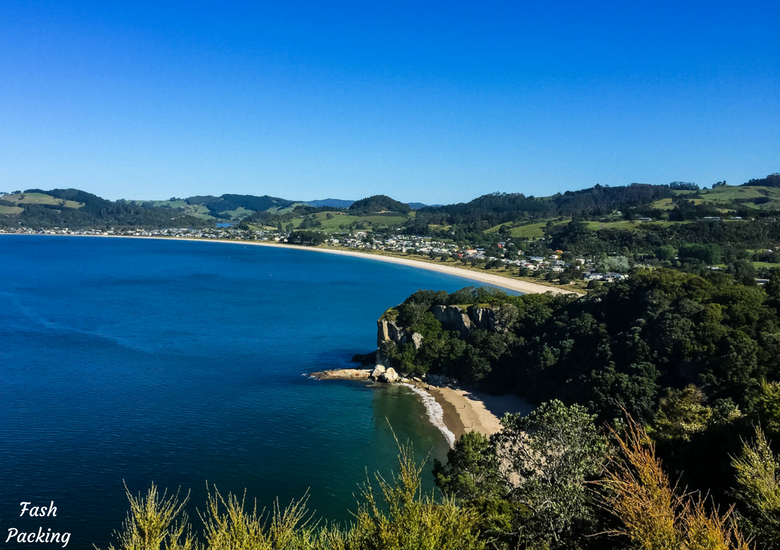 I did all the things you did on your trip, the kayaking at the coromandel was great fun I really enjoyed that and Waitomo caves I had an awesome day there. I would love to go back for a visit and catch up with all my friends but it is so far from me. Its a beautiful country and one I do miss a lot. That’s awesome Clare. He half jokes about buying one of those fancy apartments on Viaduct but that’s just a pipe dream lol. Hope you get back to NZ soon ? Wow, what an epic way to enjoy the locales of NZ! Hope when I visit New Zealand in future, I will be able to cover all these places. Everything looks so amazing, the Cathedral cove and Waitomo caves will be up in my must visit list. Definitely going to come back here for more reference in future, thanks for sharing. I would have loved to stay longer than a week but thems the breaks I guess. Hope you get to visit soon ? Super informative post!! We visited NZ a few years ago but it’s a bit of a blur now, would love to go back. Looks like you guys had a great road trip! And well, i shouldn’t have read this before dinner the food looks amazing and now I’m starving! A return visit is definitely in the cards for us as well. So much more to see in the North Island before we even start with the South! Hello Allison and thank you for sharing such a detailed review! Ever since I married an Aussie I felt a bit of a friendly teasing between Kiwis and Aussies. And is great to see an Aussie showing so much appreciations to NZ! Clearly you Kiwis and Aussies really like one another and recognise the beauty of both of the countries:) I would really love to visit NZ one day and will definitely keep your tips in mind. Thanks for sharing. Oh the rivalry is real Grace lol. Even so you cannot deny it is a truly beautiful country. I hope you get to visit soon and see for yourself exactly how spectacular it is ? And clearly you have fantastic taste in Men ? 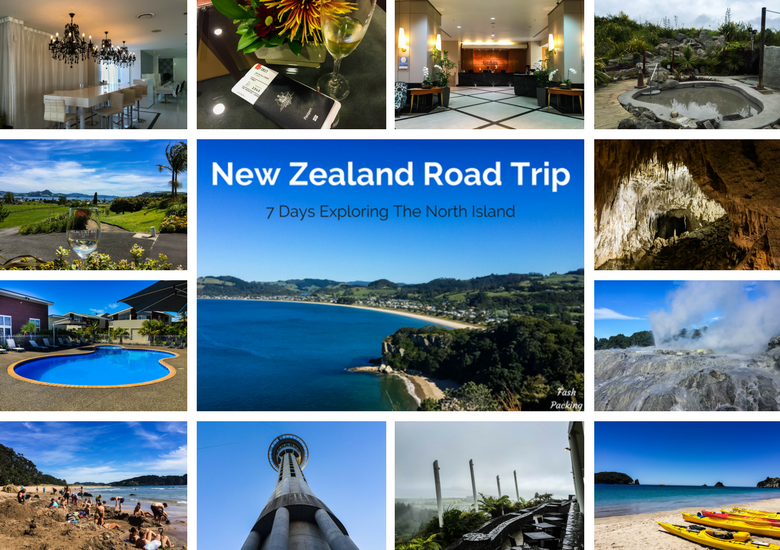 This is an epic Kiwi road trip! Once again you’ve shown the world that Kiwi’s can do really good food, it’s just that you need to go searching for it. 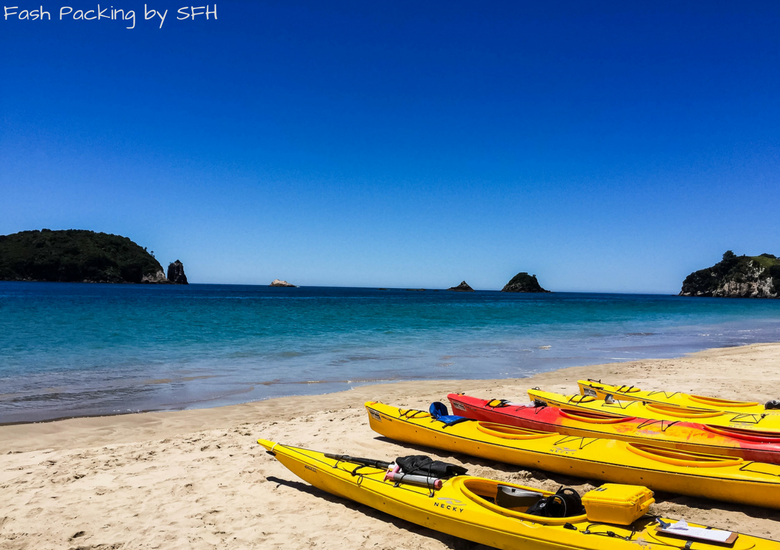 The kayaking around Cathedral Cove looks simply stunning. 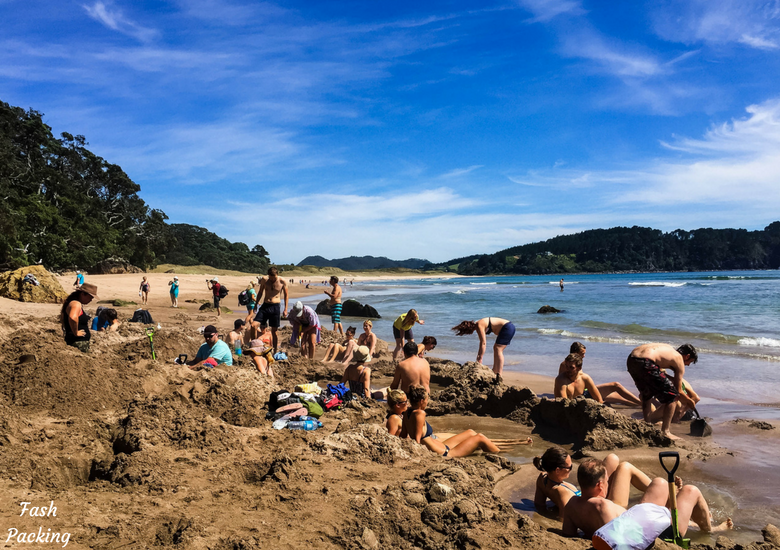 New Zealand really does have some truly amazing beachs and national parks to explore. 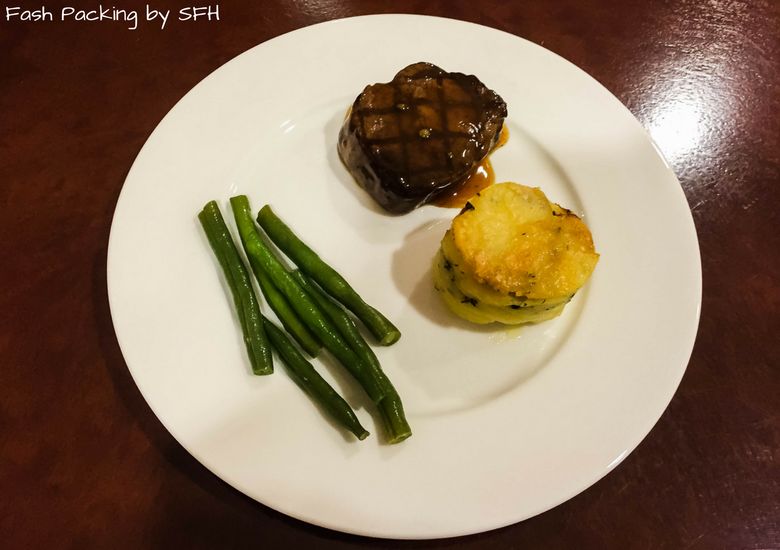 We had lots of great food but I found the service in restaurants a little lacking on the whole. The kayaking was definitely a highlight and we could not have asked for better weather on that particular day ? I am impressed with your article. You have written a lot of brilliant ideas that would be so helpful in planning road trips. I got interested to all of the delicious foods that you ate. You were in Emirates too. Amazing choice! Emirates were fantastic! Glad you got some inspiration to plan a New Zealand road trip! I really enjoyed reading your blog, it gave a detailed description of what you were doing, and as a Kiwi you really did show NZ in a positive way as well. I also enjoyed your photos as well, they were clear and bright and the blue in some of the photos (Sky and pool) was so beautiful! I was reading about your issues with Hamilton accomodation during the Blackcaps match, Seddon Park is like the Mecca of cricket in Hamilton, it’s not as bad as an All Blacks match in NZ but it’s very much a popular thing to do, particularly in Hamilton. Also I read about your surprise to how many cows there are in NZ. You’ll be shocked to know there’s now more dairy cattle than sheep in NZ as the dairy industry is now more financially viable for farmers, with a lot NZ milk going to the overseas market as it’s considered of high quality. What an amazing road trip! It’s me and my boyfriend’s dream to one day embark on a New Zealand road trip like that. The nature in NZ looks spectacular – and thanks for sharing all those food pics. Gives us more to look forward to! I hope you make it there soon Kristine! You won’t be sorry ? Emirates was amazing Carlinn! I would love to fly like this all the time! 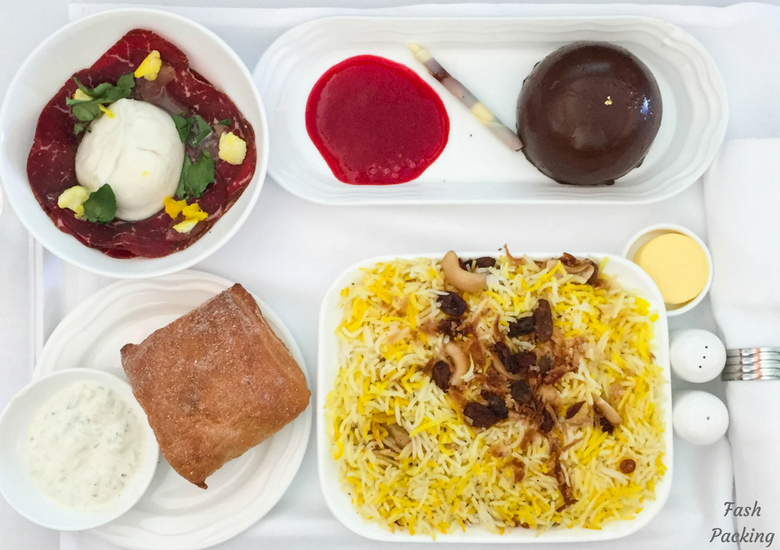 Ok first of all, Emirates Business Class looks like a dream! Seriously envious here! My friend lives in Auckland so I’m always seeing beautiful photos from the North Island that make me want to go there. 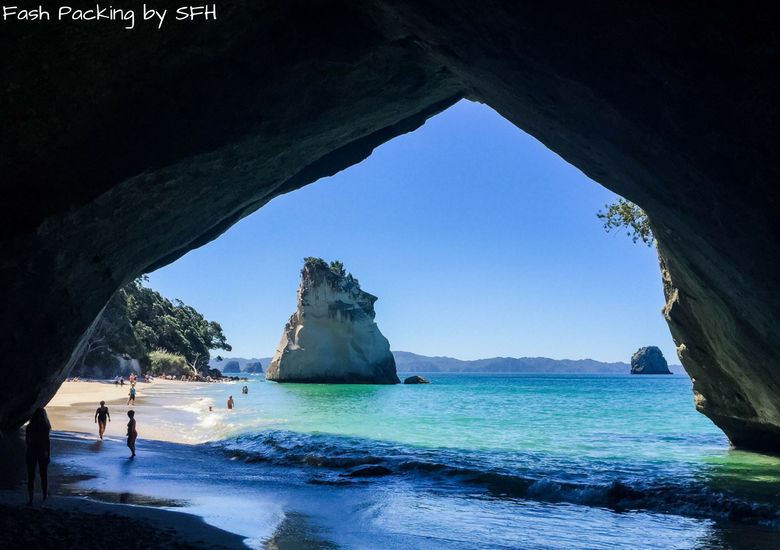 Your photos from the Cathedral Cove kayaking tour look straight out of a travel brochure. It seems like a beautiful place. I’d love to visit the caves to see the glowworms. That must have been really amazing! You’ve given a really clear itinerary that I’ll definitely be using when I go to New Zealand. How cool that you know a local Cliodhna. Cathedral Cove Kayaking was amazing and I highly recommend it. 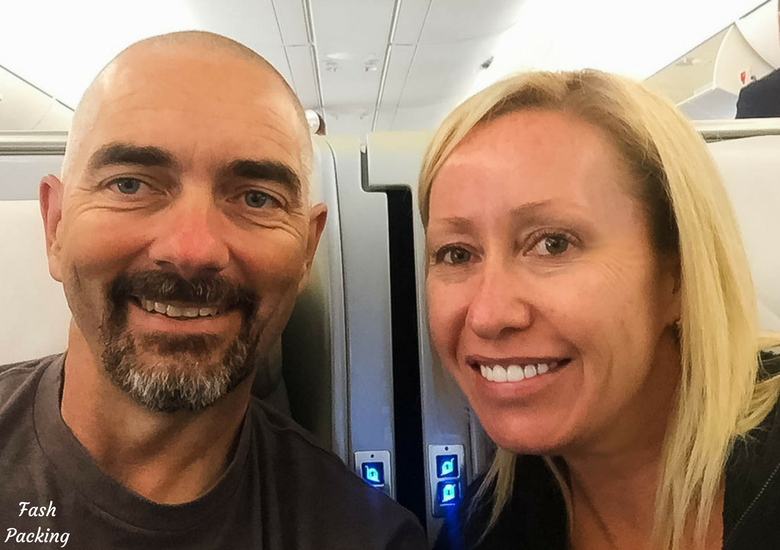 What a great short trip to NZ you did! I definitely recommend Hawke’s Bay for your next trip, I’m originally from there and it’s god’s country! Thanks for sharing! Awesome Lauren I’ll be sure to check it out when I’m next in NZ. There is still so much more to see! I have read your blogs in the past and you have once again wonderfully captured the essence of North New Zealand. Not too unnecessarily detailed but yet giving a good insight into various places one must include in their itinerary. It is also great that you manage to get sponsors on your travels. Must help you a lot with keep things going. I wish i could do the same. Getting the balance right between too much and not enough is always tricky! That’s way I have added links for this that want a more in depth look at any of the particular items featured. We did think about Hobbiton Rhiannon but I haven’t even sent the movies lol. Longer than a week is always going to be a good thing! Or soccer fans ? I struggle with FOMO and family members who need down time, too, 😉 Looks like you did a good job getting it balanced out. 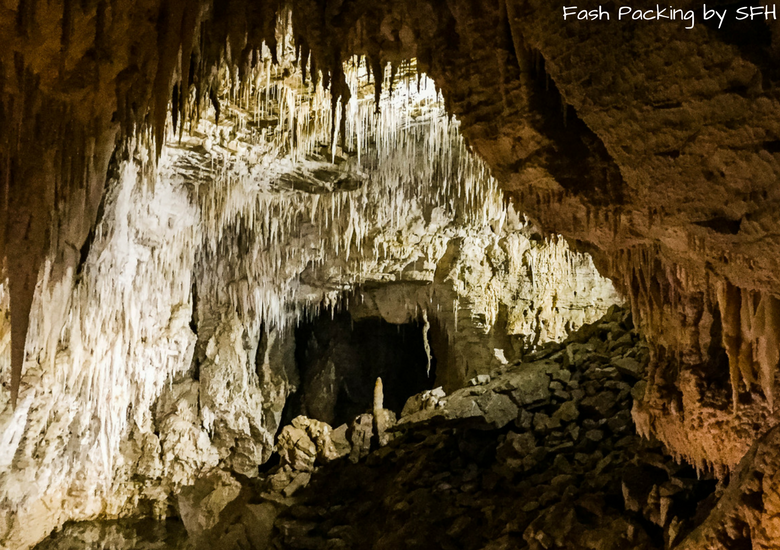 I love caves, so Waitomo Caves would be high on my list. The day spa sounds great, too. I’ve always wanted to try a mud bath. Looks like the North Island needs to be on my travel list. When I finally visit New Zealand I’m definitely going to make a road trip. I’m not going to fly there (or swim), I’ll try get a cruise over, if not, maybe a ferry if they exist. Your bargain airfares look useful, I guess I’ll need to fly to Australia first, unless I take a boat from PNG. 30 bucks is a little steep for the Auckland Tower, especially when it’s doubled for 2. 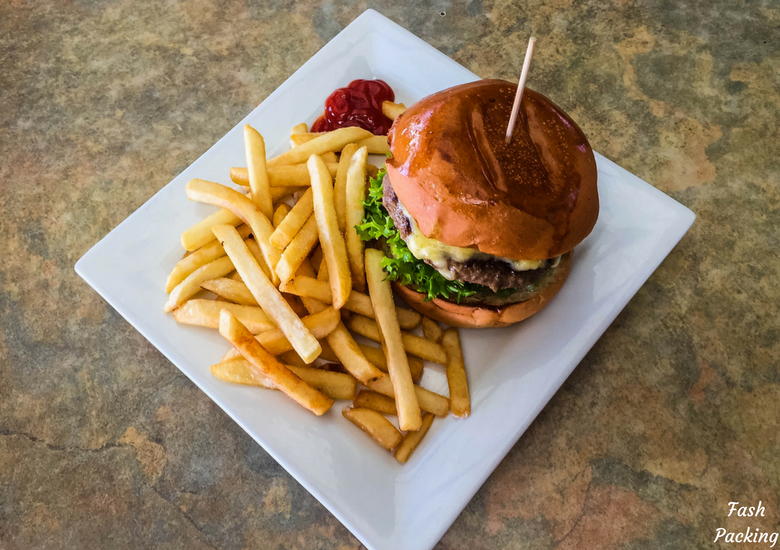 I would love to try the Burger at the Whitianga Hotel, I don’t think I’ve ever tried a burger made with NZ beef (I presume it’s NZ beef). My favourite part of your trip was the visit to Te Puia, I love photographing places like this. So you guys call beers ‘coldies’? Cruise is definitely possible but I don’t know of any ferries. I do t know of any boats that come from PNG to Oz but Sea Swift might get you close. Yes the burger was beef and defo hit the spot. Te Puia was awesome. I’m sure you would love it! Hahaha yes a beer is a coldie ? Thanks, I’ll check out Sea Swift whilst enjoying a coldie!